Opti-Men is much more than just a multi-vitamin. The 40 active ingredients that go into our unique formula will help to optimise your physical and mental performance. This high potency, nutrient optimisation system contains Five Performance Blends: Amino-Blend - Key free-form acids (including Arginine, Glutamine, and BCAAs). Viri-Blend - exotic botanicals and marine concentrates designed to give you the edge. Phyto-Blend - antioxidant-rich fruit and vegetable concentrates. Enzy-Blend - specific enzymes for enhanced nutrition digestion and absorption. And lastly, Opti-Blend – a comprehensive nutritional coverage from vitamins and essential minerals with an emphasis on antioxidants and B-vitamins. Bulking agent (Microcrystalline Cellulose), L-Leucine, Calcium Carbonate, L-Ascorbic Acid, L-Isoleucine, L-Valine, L-Glutamine, Anti-Caking Agents (Silicon Dioxide, Magnesium Salts of Fatty Acids, Fatty Acids), Magnesium Oxide, Coating (Glazing Agent: Hyrdoxypropyl Methyl Cellulose; Thickener: Glycerol), DL-Alpha-Tocopheryl Acetate, Nicotinamide, Alpha Lipoic Acid, Calcium D-Pantothenate, Green Tea Extract (Camellia sinensis, leaf), Ginger Extract (Zingiber officinale, root), Olive Leaf Extract (Olea europaea, leaf), Citrus Bioflavanoids Complex (standardized to 35% flavonoids), Rutin, Sodium Borate, Zinc Oxide, Chromium Chloride, Chromium Picolinate, Solanum lycoperiscum fruit powder (standardized to 5% Lycopene), L-Choline Bitartrate, Inositol, Copper Sulphate, Sodium Molybdate, Phylloquinone, Pyridoxine Hydrochloride, Manga nese Sulphate, Beta-Carotene, L-Selenomethionine, Thiamin Hydrochloride, Riboflavin, Cholecalciferol, Tagetes erecta aerial plant part powdered extract (standardized to 10% Lutein), Potassium Iodide, Retinyl Acetate, Cyanocobalamin, Pteroylmonoglutamic Acid, D-Biotin. To be used within the framework of a varied and balanced diet and a healthy lifestyle. Food supplements are not to be used as a substitute for a varied diet. Do not exceed recommended daily dose. Keep out of reach of children. 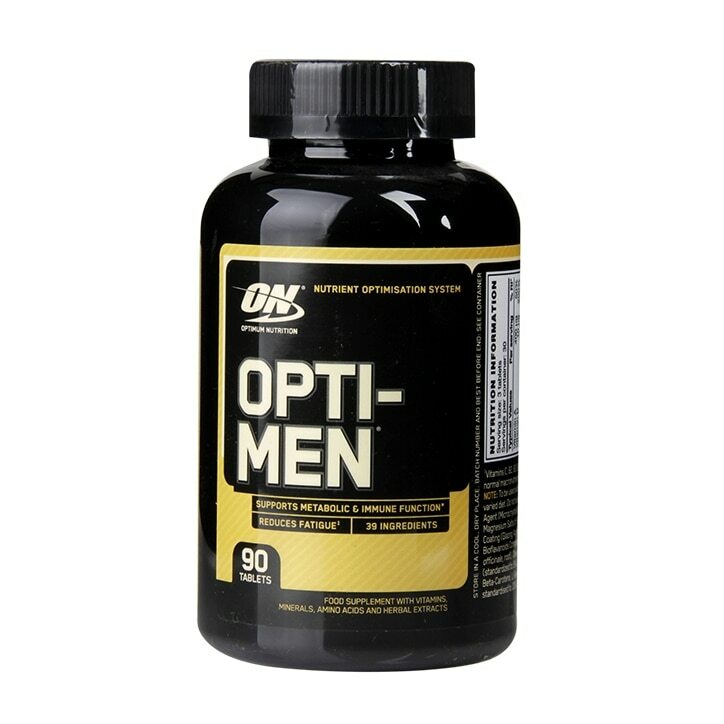 Optimum Nutrition Opti Men Tablets is rated 5.0 out of 5 by 1. Rated 5 out of 5 by Jackie5567 from Great product Absolutely love this product, had to buy myself 5 little tubs just to make sure i was topped up. Was unsure at first as i was told by a friend but i did my own research and found out it was approved by local Doctors.